Refraining from lifting more than 17 pounds. Employers may not ask for written certification from a healthcare professional for the accommodations in 1–4 above. Employers may request written certification from a health care professional regarding the need for the accommodations in 5–8 above, or for restrictions on lifting 17 pounds or less. The Civil Rights Division accepts complaints that an employer has failed to accommodate an employee’s pregnancy. You may contact us at pregnancy@atg.wa.gov or by leaving a message on our toll-free line at (833) 389-2427. You may also submit a complaint using our online form and a staff member will follow up with you. 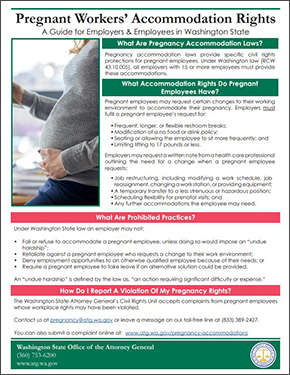 This one-page flyer provides information about the specific accommodations required for pregnant workers under Washington state law. The flyer is designed to inform both employees and employers of their rights and responsibilities under the law, and is available in both English and Spanish. The flyer outlines what pregnancy accommodation laws are, the rights that pregnant employees have in the workplace, which practices are prohibited for employers, and how pregnant employees can report pregnancy accommodation violations.